Head to Waiheke Island, a place of white sandy beaches, palm trees, great wine, and relaxation, just 35 minutes off the coast of Auckland. Waiheke Island is known for adventure, wineries, breweries, wildlife, and outdoors. Your plan includes some of its best attractions: indulge your senses at some of the top wineries in the area, learn about winemaking at Mudbrick Vineyard, take in nature's colorful creations at Sacred Blessing Sanctuary Gardens, and indulge your thirst for a good beer at Wild on Waiheke Restaurant. To find maps, other places to visit, and other tourist information, read Waiheke Island vacation planner . San Francisco, USA to Waiheke Island is an approximately 17-hour flight. The time zone difference when traveling from San Francisco to Waiheke Island is 20 hours. Traveling from San Francisco in August, expect Waiheke Island to be little chillier, temps between 59°F and 47°F. Finish up your sightseeing early on the 22nd (Wed) so you can travel to Great Barrier Island. 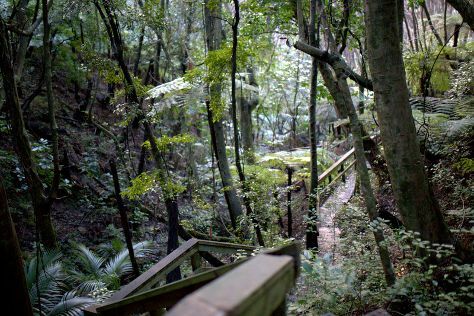 Start off your visit on the 23rd (Thu): look for all kinds of wild species at Glenfern Sanctuary and then trek along Aotea Track. For ratings, maps, photos, and other tourist information, you can read our Great Barrier Island trip itinerary planning site . Explore your travel options from Waiheke Island to Great Barrier Island with the Route module. Finish up your sightseeing early on the 23rd (Thu) so you can travel to Warkworth. Warkworth is a town on the Northland Peninsula in the upper North Island of New Zealand. On the 24th (Fri), immerse yourself in nature at Tawharanui Regional Park and then don't miss a visit to Matakana Village. Get ready for a full day of sightseeing on the 25th (Sat): contemplate the long history of Couldrey House & Garden, enjoy the sand and surf at Orewa Beach, and then have some family-friendly fun at Snowplanet. To see photos, where to stay, traveler tips, and more tourist information, go to the Warkworth planning tool . 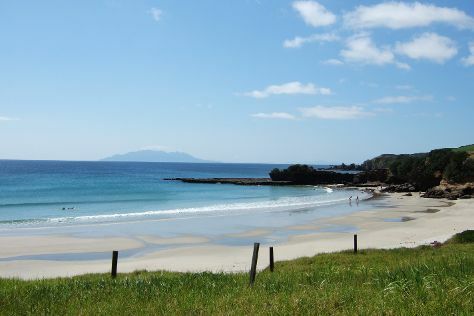 The Route module can help you plan travel from Great Barrier Island to Warkworth. In August in Warkworth, expect temperatures between 53°F during the day and 53°F at night. Finish your sightseeing early on the 25th (Sat) so you can travel to Auckland Central. Auckland Central is known for nature, museums, nightlife, parks, and zoos & aquariums. Your plan includes some of its best attractions: take in panoramic vistas at Sky Tower, explore the activities along Devonport, contemplate the geological forces at Mount Eden, and examine the collection at Auckland Museum. Plan my trip to Auckland Central with suggested itineraries provided by Inspirock. Drive from Warkworth to Auckland Central in an hour. In August, daytime highs in Auckland Central are 53°F, while nighttime lows are 53°F. Wrap up your sightseeing on the 31st (Fri) to allow time to travel back home.